Mexican-born and New York-based artist Aliza Nisenbaum has been artist-in-residence, living and working in Brixton Station for three months. 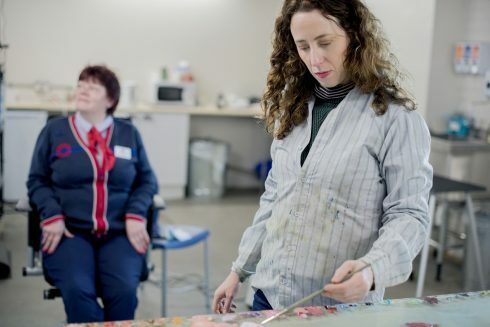 Through an open call, Nisenbaum selected members from Transport for London staff from Brixton station and the Victoria line including train drivers, customer service staff and cleaners who, over several hours, have been painted. These individual portraits will be combined into one large painting then photographed, printed on vinyl and displayed above the entrance to Brixton Underground station. The artist would like to invite local residents for a coffee morning at her Brixton studio. Guests will have an opportunity to see her finished painting, commissioned by Art on the Underground, meet the artist and hear more about her work. The work is the first UK public commission by Nisenbaum and is the second commission in a new series at Brixton. The programme has selected artists to respond to the diverse narratives of the murals from the 1980s, the rapid development of the area and the wider social and political history of mural making. Entry to the studio is outside Brixton Station. Please meet at the set of metal double doors, located on the left hand side at the top of the stairs.